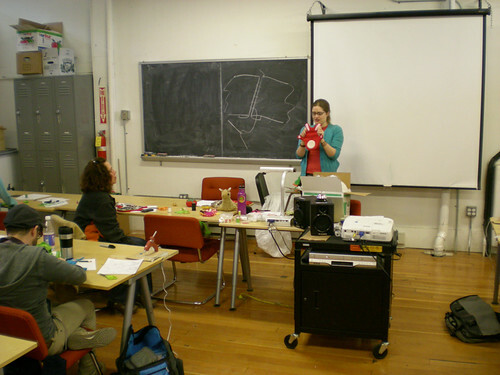 On December 10th 2011, at the Center for Cartoon Studies I taught a 3-hour plush toy workshop. It was open to all ages, so there was a nice mix of kids and adults. 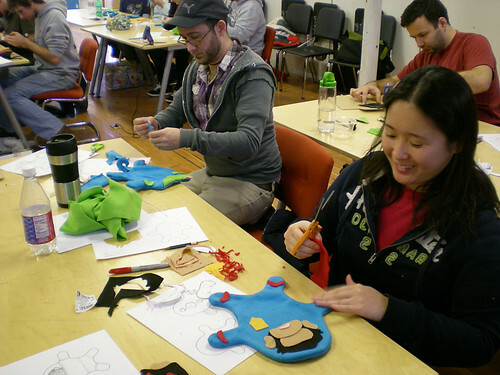 The class ended up being totally full with 24 people ready to make some toys. Alec volunteered to be my assistant teacher for the day and was a huge help making sure everything ran smoothly. My goal for the workshop was to have everyone go home with a customized plush character. I didn't know the skill levels of the participants, so I assumed everyone was a beginner but left room for each person to use any existing skills. Before the class, I created a simple blank body shape out of fleece that could be translated into many different ideas. 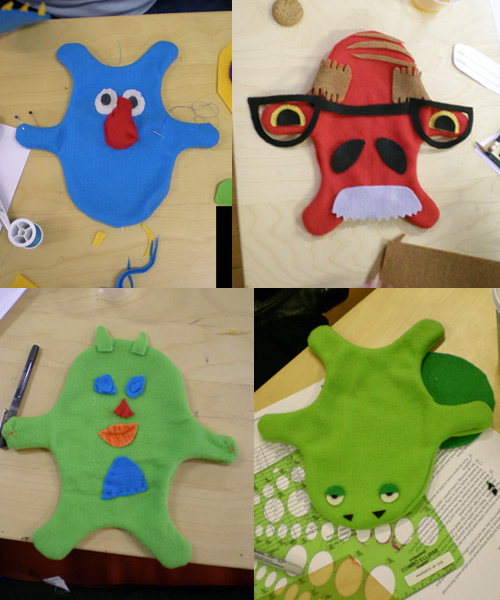 Each person took that shape and using additional felt and fleece fabrics turned it into their toy. Everyone participating really showed me how many variations could be created from a single shape, all sorts of different and amazing creatures were made. I had a great time sharing some toy design skills and everyone went home with a cool plush toy, so I hope they had a good time too. I didn't get photos of the finished stuffed toys, but here are some as they are being created. That's so cool! Will you be doing a plush workshop this year? Thanks! Unfortunately since I'm not living in Vermont any longer there won't be a workshop this year.